Historical Background of the Book. After the Assyrians destroyed the Northern Kingdom in 720 and carried them off into captivity, they continued to expand their empire. As a result, they started to threatened the Southern Kingdom as they had the Northern Kingdom with military conquest , most notably around 711 B.C. and 701 B.C. Jerusalem (the capital city of Judah). Ch. 1 Coming punishment for both Israel and Judah. In the near future, this would occur at the hands of the Assyrians. 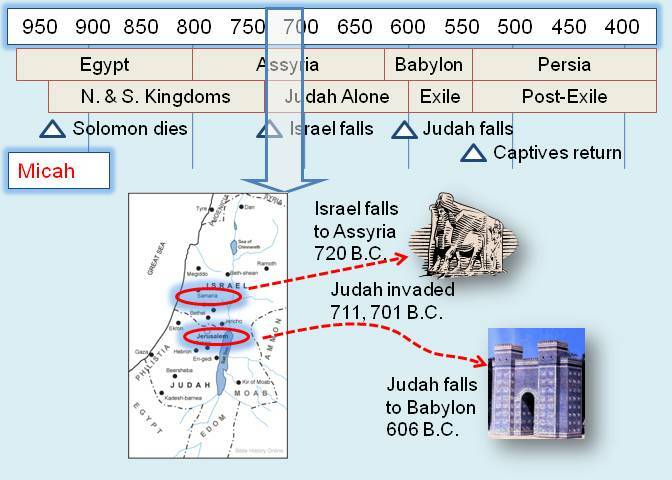 About 120 years after that, Judah would be conquered by the Babylonians. Ch. 2-3 Reasons for the punishment given: greed, false prophets, violent injustice, bribery, and idolatry. Ch. 4-5 Prophesy of future restoration and glory. Ch. 6 God's indictment of His people. Ch. 7 Need for righteousness, confession of sin, and the Lord's mercies.